Cycling makes you lean, not bulky. Longing to lose weight, but you bulk up the second your hand touches a dumbbell? Some women are naturally more muscular than others, and while you'll never build biceps like a man, you may feel self-conscious about your frame after working out. Instead of ignoring exercise, choose moves that will leave you slim and toned, not masculine. And don't forget about your diet. The Mayo Clinic reveals that what you eat is even more important for weight loss than exercise, although exercise rules when it comes to maintenance. Cardio burns buku calories without building too much muscle, so make aerobic exercises your primary focus. 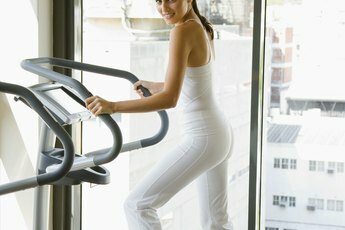 Top picks for weight loss include jumping rope and running, both of which can torch more than 1,000 calories per hour. Other effective calorie-slashers include tae kwon do, walking up stairs and playing football. Choose an activity that you enjoy; you'll be far less likely to call it quits. If the thought of resistance training makes you shudder with fear, relax -- as muscular as you may be, you simply don't have the testosterone to build a manly physique. To ensure minimal bulk, use low weights or body weight only and perform multiple repetitions. Enhance feminine curves with squats to shape your legs and rear, V-ups to tone your tummy and assisted pushups to perk up your chest. To avoid developing poor posture, be sure to pump every muscle group. Just don't work the same muscles two days in a row, or you risk overuse. Yoga counts as strength training, and has some added bonuses. It both strengthens and stretches your muscles, leading to greater flexibility and balance. At the yoga studio, you will perform breathing exercises along with multiple poses. The activity burns some calories, and is also a sort of meditation; you will leave class feeling more peaceful than when you walked in. The Mayo Clinic reports that yoga may also lead to healthier lifestyle choices, aiding your weight-loss efforts. If classes are too expensive, opt for an instructional DVD. For a killer workout you can stick with, take a practical approach. See your doctor if you are over 40 and do not currently exercise, or if you have any medical conditions. Start your routine slowly, stopping if you feel strained or weak. Expect some stiffness and sore muscles until your body gets used to exercise. Try to work out at the same time of day to form a habit, and switch up your activities to keep boredom at bay.